Arriving at a meeting of the 27 EU leaders in Brussels the furious Paris chief said the negotiations would be carried out “in the interests of Europe” and not the UK and said France would push for a hard line in the talks. Mr Hollande, who is entering the last week of a disastrous four-year tenure in the Elysee Palace, said any settlement with Britain “doesn’t have to be punitive” but stressed it would have to result in the UK being worse off. And he also insisted that Mrs May will not be able to use a strong mandate from the British electorate to try and sway the talks, saying the terms on which the EU will negotiate have already been set and are inflexible. He told reporters: “This Brexit will be negotiated in the interests of Europe. France will play its full part to support the divorce so that the UK can leave under good conditions for Europe. Earlier Luxembourg’s prime minister poured scorn on the upcoming UK General Election as an “internal problem” within the Tory party and said Britain was seeking not a hard or soft but “Theresa’s Brexit”. 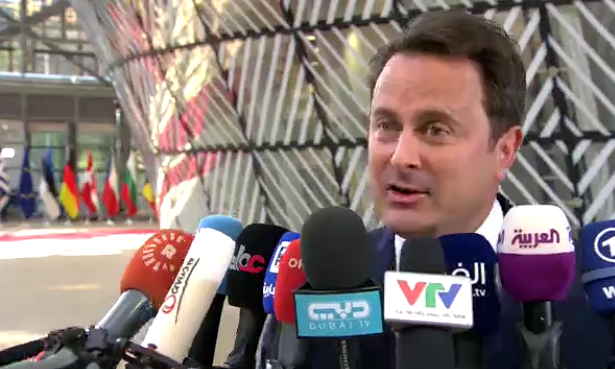 Xavier Bettel said the result of the June 8 contest will have “no” bearing on the outcome of the divorce negotiations and will not result in the PM having a stronger hand in Brussels. Theresa May has centred her campaign on the claim that only a big win for the Conservatives will allow her to take a tough stance with eurocrats during the negotiations. Mr Bettel’s remarks came after EU Council president Donald Tusk vowed to handle the negotiations “with genuine care” as he arrived at the first ever meeting of the bloc’s leaders without Britain present. The EU Council president reaffirmed his commitment to securing a “close and strong” relationship with the UK after it leaves the bloc as Europe prepares to formalise its negotiating hand. Leaders of the other 27 member states are meeting in Brussels today to sign off on the club’s guidelines for the divorce talks at an historic meeting which will kickstart the leaving process. 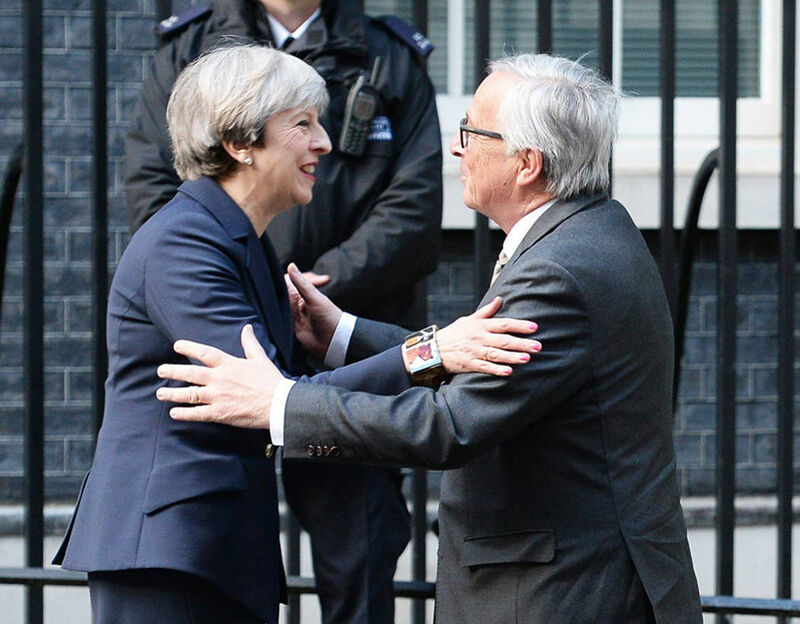 Speaking to reporters as he arrived at the summit, Mr Bettel was asked whether or not he thought a big win for Mrs May on June 8 would strengthen her hand at the negotiations. He replied: “No. No, why? She decided to organise, the party decided to organise the referendum. We didn’t ask it. There is a result. She wants to have a new election, it’s her decision. It is the first ever EU Council meeting without a British prime minister present, and will be used exclusively to discuss Brexit with no other items on the agenda. Under the draft guidelines, produced by the EU Commission’s chief negotiator Michel Barnier, the UK has to agree to settle the terms of the divorce before talks can begin on a trade deal. Eurocrats are insisting that three issues – citizens’ rights, a financial settlement and the border situation in Northern Ireland – are all sorted before future relations are discussed. Arriving at the meeting at the EU’s new Europa building in Brussels this morning, Mr Tusk told gathered reporters: “We all want a close and strong future relationship with the UK. “There’s absolutely no question about it, but before discussing the future we have to sort out our past and we will handle it with genuine care but fairly. This is the only possible way to move forward. Mr Tusk also paid tribute to the strong sense of unity which has prevailed within Europe over Brexit, something which has shocked even the most senior eurocrats. Brussels officials have been genuinely surprised by the extent to which member states which usually quarrel at will have put aside their differences to present a united front to Britain. Yesterday a senior EU Council official said he had “never seen net payers and net contributors working so closely together” on one single issue. 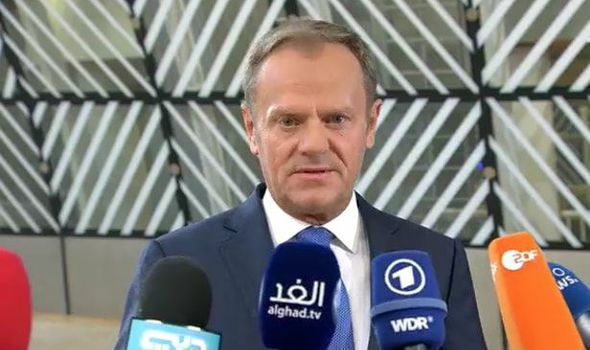 And Mr Tusk stressed that he had received “strong support” from all of the EU’s institutions, which are often at loggerheads over policies. Negotiations between the UK and the EU are due to begin in early June once the General Election campaign in Britain has been concluded. Yesterday EU officials struck an optimistic note on how the talks can progress, saying they were hopeful discussions about a trade deal can be opened “by the end of the year”.